Recently, I had to go through the implementation of a cheque clearing system; so, either because of the naive skull sticked on the top of my shoulders or the lack of documentation to find a clear business process, I was unable to understand it; let alone to tell the product users how things work. And to my amuse, the business guys on the customer end were not sure about the inter-department business processes that happens with Inward/Outward processing of cheque. The guys with technology can only talk about the core banking stuff(for instance, how Phoenix web service would expose the data, or from which Mosaic view/table we can get/update what we want). Fortunately (the absence of fortunate has been named unfortunate), my friend google didn't provide me with anything useful that I could use/understand. Much appreciated by the customer, I thought of updating the visual to make it more generic, since the business process is the same for any bank around the globe, so that it would help at least someone who is looking for something similar having skull positioned as mine. The cheques submitted to bank B, by the customer of bank A. 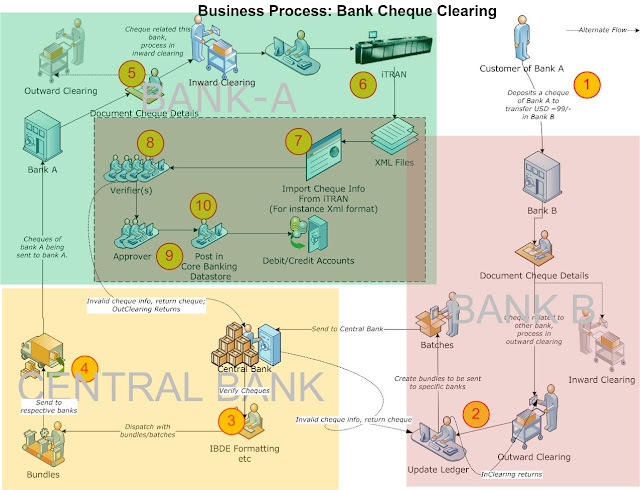 The bank B would process those cheques as Outward clearing, and bank A is going to process those cheques as Inward Clearing. See step 2(Out clearing) and step 5(In clearing). If any of the information provided by the cheque issuer mismatches the actual information of customer account, then the cheque is returned; returning from Inward would go as Inward Returns, and returned to Outward goes as Outward returns. See the alternate flows in the figure. The bank B (not Bank A) would process those cheques as Outward clearing, and bank A is going to process those cheques as Inward Clearing. I think so. The step 1 should be the customer of bank B deposit the check of bank A to transfer the money from bank A to bank B. Nice post! The traditional way of ordering and reordering checks is through a request at your bank or credit union to issue a batch for you. Though this can be the most known way of how to order checks, most people these days don’t go through their banks anymore. Nice post! Bank check designs come in an unlimited array of styles prints and patterns. now you are able to add your own custom designs to checks or even make your own photo checks with customized check designs. Ordering online nowadays can be an artistic journey. Or at least a fun experience. Absolutely right hayley,,,i agree with you! Personalized or customized checks can be pre-designed, or you can choose to design the check on your own. You can even get personalized checks with pictures. Thanks for sharing..
Nice post! The traditional method of ordering and rearrangement checks is thru requesting that your bank or banking company issue a batch or checks for you. Celebrate your favorite football team with our Yellow & Black Football Team Personal checks. Thanks. Nice post! When ordering your checks, you will want to have your personal or address info available. The remainder of the process only needs to be about how inventive you can be when designing your checks. Thanks. Nice post! This can be the best part. The concept of customization as it relates to bank checks ordered online refers to the information or artwork that can be placed on the face itself. Thanks. You may hear that a check you deposited has cleared, but what does that mean? The bank may tell you that the check has "cleared", but you may not be in the clear. Clearing checks is a confusing process, and scammers take advantage of that confusion. Make sure you know the risks of depositing and clearing checks. Nice post! Cheque is used for paying a large sum of money. It is the most widely used tool for drawing money from the bank. Cheque is used by the buyer or debtor to pay the due amount of goods to his seller or creditor out of his bank deposit. Thanks. You can order checks according to your personal or professional need. You can order standard single checks which are offered with ‘no record’ facility. There are duplicate checks available in the market, which offer carbon copy facility for each check. You can also order Bank checks with stub checks. These checks are very common in organizations as they are available with proper record facility. Wonderful post! Checking account holders must be aware that when you order bank checks online, you will be required to provide some sensitive personal and financial information. Thanks for such a nice blog. Nice post! Banks and credit Unions would love to be the only avenues from which you order your checks. Now, thanks to the online world, check ordering is much easier and less expensive. Most of the time when you order checks the banks merely order the checks for you thru other check printing companies. currently you may be ready to order bank checks yourself directly online. thanks. Nice post! Bank check styles are available in a limiteless array of designs prints and patterns. Currently you’re able to add your own custom styles to checks or perhaps create your own image checks with customized check styles. Thanks. Nice post! This was the most common way to order checks. Most people no longer go through their banks to order online checks because the check costs are far too expensive. Most of the time the banks simply order the checks for you through other check printers and mark up the price even further. Nice post! Checking account holders must be aware that when you order bank checks online, you will be required to provide some sensitive personal and financial information. Thanks. Cheque is an instrument in writing containing an unconditional order, addressed to a banker, sign by the person who has deposited money with the banker, requiring him to pay on demand a certain sum of money only to or to the order of certain person or to the bearer of instrument." If you’re using your checks for business, don’t worry because there are some people who’ve decided to go for a more formal look by keeping the original design of their checks, except they’ve added a few more helpful information that their clients can use. Bank checks come now in different styles and designs with a wide selection of personal bank check options.You can go through our site for more details.